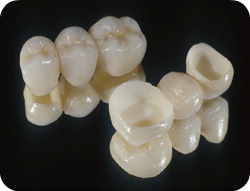 What is full ceramic bridgework? Dental bridges are a great way to replace missing teeth. They are functional as well as pleasing to the eye. Bridges are made from porcelain and ceramic to ensure that they are strong and durable. They can also be used as an alternative to dental implants, offering many patients a non-surgical, more cost-efficient way to replace missing teeth. Your existing teeth are used to literally bridge the gap where the middle tooth used to lie. What is the process of getting dental bridges? Patients will be fitted with a temporary bridge while our lab crafts the permanent bridge. This will protect the abutments and any exposed gum areas, making your smile more appealing and masking the gap left by a missing tooth. Once the permanent bridge has been created, a follow-up visit will be scheduled to set the bridge, which will be placed on the abutments. The dentist will then use an adhesive to make sure that the bridge is set. What happens after I have my dental bridge? The bridge may take a little while to get used to, but after a few days, it should feel like you have your old teeth back again. You should eat soft foods for the first few days after having your bridge placed, but after the initial phase, there should be no issues with any foods. If you are missing a tooth, you should strongly consider having it replaced. Besides the aesthetic disadvantage of missing a tooth, it could also cause structural changes to your mouth and jaw, as well as making it difficult to eat or speak properly. Set up an appointment today to restore your smile!